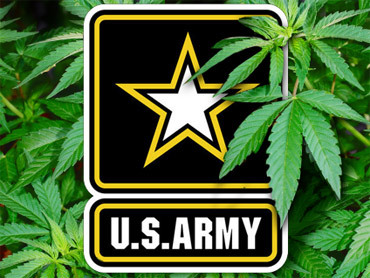 Rocky Mountain High: U.S. Military Didn't Mean to Grow Marijuana! COMMERCE CITY, Colo. (CBS) Military marijuana? The U.S. Army planned to cover a chemical weapons site with grass and weed – but not the kind of grass and weed that's actually cropping up – the kind that's illegal. The Army made the unwanted discovery during the cleanup of the Rocky Mountain Arsenal northeast of Commerce City, Colo. Part of the cleanup includes reseeding some areas. But when that seed started to grow, marijuana popped up. It isn't commercial grade, but it's still an illegal drug. Known as ditch weed or feral hemp, it grows wild in some places. The army's Charlie Scharmin, who's in charge of the cleanup, was caught off guard by the discovery. "Not something you expect in an environmental cleanup job," says Scharmin. "It was a little surprising." Scharmin says the army was finishing containment of two large contamination areas at the former chemical weapons production site, when they laid down rock and clay, and then put vegetation on top. But it wasn't just any vegetation. "The specification is that we acquire weed-free mulch from the supplier," explains Scharmin. The military blames the supplier for the snafu, saying the mulch for ground cover was purchased from a place in Kansas where the low-grade weed is common. Some of it apparently got mixed in with the grass. So to speak. The Army made the first discovery of hemp on the property in June. So far they've picked about 100 plants that Scharmin says are low-grade. He says they plan to mow, burn or maybe even have bison eat the rest. "Fish and Wildlife Service does not seem to have any concern about having bison out there," Scharmin says. Shaun Boyd is an award-winning reporter with 20 years experience. She has covered some of Colorado's biggest stories including Columbine, the University of Colorado football recruiting scandal, the Prof. Ward Churchill controversy and the JonBenet Ramsey murder investigation.